I use this on long flights/drives to help my tight back/glutes. It’s effective and otherwise unobtrusive. I bought this to help my wife relieve knots in her shoulder/neck area. She is very sensitive about pressure, so this product allows her to apply pressure as and where needed. In a circular of back and forth motion the TT works best on a thin fabric garment. Directly on the skin, it has a tendency to create friction inhibiting smooth and even pressure. I am sue it could be used applying a soap solution or lubricant on the skin. It is easy to grasp. Happy with the product. Always looking for ways to relax tight muscles. Arrived quickly. I love Grommet for the many helpful products & ideas advertised very well. Keep up the good work. Once you find your trigger points this works quite well. Much easier to use on side opposite dominant hand. Takes a bit of doing to figure out your personal technique. I'm happy with this new Grommet. At first it wasn't battery connected; am content after using for a few weeks. I'm always looking for ways to relieve pain and knots from my shoulders and upper back while I'm at work. Sadly, I find it easier to work knots out with my hands because I'm not able to apply a lot of pressure to small areas with this tool. And it's no better when used by someone else to massage my muscles. It came without any sort of suggestions on how to use it. I basically paid $20 for a piece of plastic. A racket ball is much more efficient for my needs - and way cheaper. Muscles in the human body are so interconnected that even one painful knot in your back can tug at your neck, which gnaws at your shoulder, which numbs your arm. Relax. With Tiger Tail therapeutic massage tools, the next time you feel a kink, just roll with it. Tiger Tail was founded by Spring Faussett, a former D-1 soccer player, whose physical therapists suggested using a foam roller or rolling pin to heal scar tissue after ACL surgery. Instead, she designed a hybrid of the two that worked more efficiently—and she manufactures it in the USA. The best selling Classic Tiger Tail is a conveniently sized (18") roller that allows for individualized pressure control. It releases and relieves sore muscles in as little as 4 minutes. 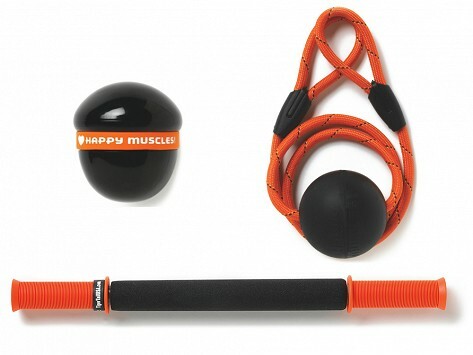 The Tiger Ball is a massage ball on a rope. It targets tough areas in the neck and back.